Worship is central to who we are and what we are about. Each worship experience includes time of reflection and prayer, time with the Scriptures, a powerful message, and singing. We praise God and spend time in awe. We are challenged and renewed. Early Morning Chapel Worship | 8:00am Our early service has a distinctly traditional feel as we gather on the second floor in the Bobbie Fox Chapel for this intimate service. We join in the sacrament of communion regularly, sing traditional hymns, and experience the full sermon in this 45 minute service. 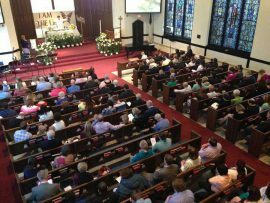 Sanctuary Worship | 9:30am Our later service in the main sanctuary has a variety of elements to engage the congregation. The organ, as well as a praise band, contribute to this service, which is led by a group of dedicated singers of all generations. A stimulating mix of contemporary Christian songs, traditional hymns, and special music support the worship. Our children’s choir is active and enthused, and hand bell music is an all-ages activity. This service also incorporates full media, utilizing videos and projection screens. Together we lift our voices and our spirits. Family Sunday On the first Sunday of every month, the children remain in the worship service to with their families. This is a great way for children to learn how we worship and to serve as candle lighters and to assist the ushers. Holy Communion In the United Methodist Church, we celebrate communion on the first Sunday of the month with an open table, to which all God’s children are invited! Gluten-free wafers and non-alcoholic fruit of the vine are used in order that all persons may participate. Hospitality Time | 10:30 – 11:00am Spend time with members of the congregation and guests in the Parlor as you enjoy coffee, tea, fruit juice, and refreshments. Sunday School for children, middle schoolers, and senior high. Learn more here. Child Care Child care is available for infants and toddlers up to 3 years of age from 9:00 – 11:00am.